Scholarships Available from Area 9! Registration for the 16th International Handbell Symposium in Jeju, Korea is now open. Please GO HERE for details. 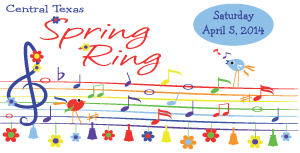 In the midst of all the dramatic weather that has been happening around the US, it is time to start looking forward to spring and all the fabulous ringing opportunities that are available to feed your handbell habit. Central Texas Spring Ring is right around the corner in Austin, TX and Summit 2014 in Ardmore, OK will be here before you know it. We hope you will consider attending one or both of these events. Registration & Class Schedule for Summit 2014 is Now Available! We hope you will consider attending. 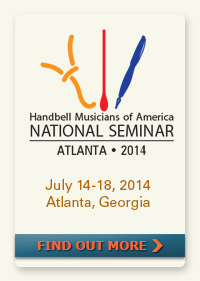 There will plenty of opportunities to ring and learn about handbells. Some of the offerings include Duet & Trio Ringing, Mallets & Stopped Sounds, Musiciality in the Musicially Challenged, Heavy Metal aka Bass Bells, 4-in-hand, Bell Trees, Battery Techniques, Choosing Music for Worship, Move & Groove with Tim Waugh, All Ring Sessions, Reading Sessions, Massed Ringing and Summit All-Stars.